정맥 내 투여 후 60 분 이내에 혈소판이 95 % 이상 감소됩니다. points. Results are mean s.d. of 6 mice per group. characterization of the mouse von Willebrand factor receptor GPIb-IX with novel monoclonal antibodies. antigen-specific mechanisms in the development of immune thrombocytopenic purpura in mice. Blood. 3. Elzey BD, Tian J, Jensen RJ et al. 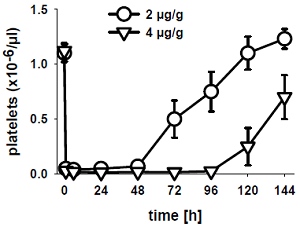 (2003) Platelet-mediated modulation of adaptive immunity. A communication link between innate and adaptive immune compartments. Immunity.19:9-19.